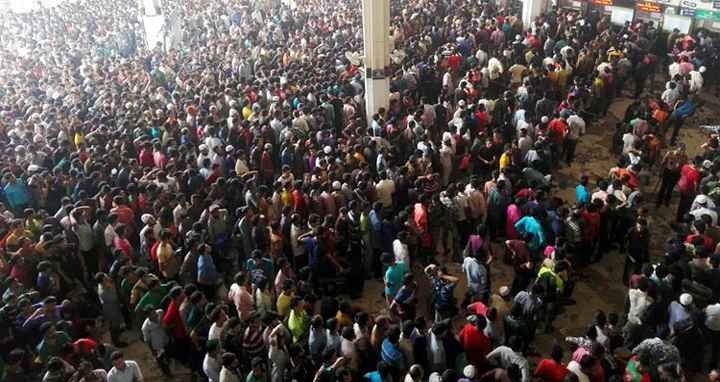 Dhaka, 5 June, Abnews: A huge crowd of people continued on Tuesday at Kamalapur railway station to fetch train tickets for going home to celebrate Eid ul-Fitr to avoid the tiresome traffic congestion on highways. During visit on Tuesday it was seen that Bangladesh Railways continued it’s selling advance tickets of train service for June 14. As per the Railway’s previous announcement, tickets for June 11, 12, 13, 14 and 15 will be available on June 2, 3, 4, 5 and 6 respectively. The ticket sale will continue till June 6. Besides, the sale of the return ticket will start from June 10 and continue till June 15. A total of 25 percent tickets will be sold through online and rest of amount will be available at ticket counters. Each passenger will be able to buy maximum four tickets.